Eclipse 2017: Where Will You Be When the Sun Goes Away? In less than a month, on August 21, 2017, the Moon will cast its shadow upon the Earth, a relative pinprick at only 60 miles across. The shadow will begin in the Pacific Ocean off North America, make landfall south of Portland, Oregon, and rake diagonally across the United States. Charging southeastward at about 2000 miles an hour, the path of totality will touch 12 states before racing off into the Atlantic Ocean around Charleston, South Carolina. Those are the dry facts of the eclipse, the wheres and the whens of an event that hasn’t been visible to a majority of the US population in 47 years. But beyond the science and the natural wonder of the celestial alignment lies a simple question: Where will you be when the sun goes away? Bullseye! The center of totality passes right through North Menan Butte in Rexburg, ID. 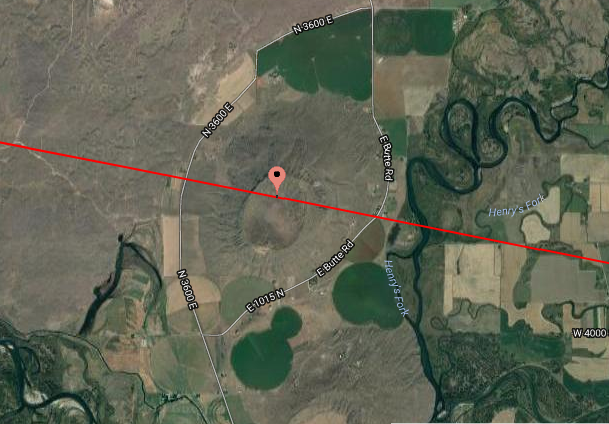 For me, the answer is simple: I’ll be smack dab in the middle of totality on top of an extinct volcano in eastern Idaho. To see an eclipse is pretty cool; to watch the mechanics of the heavens work above you while standing in a unique geological feature will be far cooler. It will take me eight hours to drive to Menan Buttes with my family from our home in the Panhandle; Idaho is an enormous state. We’ll be camping on private land outside the southern butte, probably in pretty rustic conditions and without a lot of rough camping experience. OK, none. But I don’t care because I want to see totality, and the 92% totality we’d see if we stayed home just won’t cut it. While most people will likely have their eyes cast heavenward with their cheap cardboard and plastic eclipse glasses or shade 14 welding lens when the big moment arrives, my eyes will be locked on the ground to the west of our vantage point. Menan Butte stands about 500′ above the flat, featureless Snake River plain, and I intend to watch the moon’s shadow racing across the planet toward us. That’s the draw for me, and I hope I get to see it. That’s not to say I won’t look skyward once the shadow is upon us, gazing in wide wonder at the incandescent dance of our sun’s atmosphere against the suddenly dark sky. I’ll bask in the unnatural twilight, listen to the gasps and cheers of my fellow watchers, and feel the sudden temperature drop, which should be quite marked in the east Idaho drylands. We’ll have about two minutes of totality before the shadow races east toward the vast majority of the US population, and I plan to enjoy every second of it. Aside from just watching the eclipse, there’s plenty else to do. Hackaday.io members across the country are hosting Hackaday Eclipse Meetups, where like minded folks can mix and mingle before the eclipse. If you know where you’ll be to watch the eclipse — like an extinct volcano, for instance — and you don’t mind sharing the experience with some of your fellow enthusiasts, be sure to post a meetup on the Eclipse Meetups page. Make your event page and we’ll send you some eclipse glasses with the Jolly Wrencher on the side of them for you and your guests. Have you started thinking of what you’re going to bring with you to the viewing? There are a lot of eclipse projects, from pinhole cameras to watch the eclipse safely, to the Ham operators who will be taking advantage of localized ionospheric changes to make long-distance contacts. Those of us with telescopes might want to build a low-cost solar filter. Someone will likely be trying to prove General Relativity somewhere along the path of totality, and we’d love to see the rig for that. And there will no doubt be petabytes of photographs and videos taken with everything ranging from smartphones to professional cinematic cameras. We’d love to hear what you’re planning and see your setups. And even if you’ve got something cool that’s not eclipse related, bring it along. It’s always a good time to talk shop for hackers.